Fire disrupts a British family gathering. The Hollands are a sorry lot. Patriarch Josh spends much of his vast fortune covering younger son Gideon’s business losses. Daughter Daphne is ready to shed her second husband, Alaric, in favor of Greek-god handsome Olympic hopeful Giorgio. Only older son Steve seems to have any common sense, and Josh has shunted him into the unglamorous maintenance side of the family’s real estate empire. Perhaps to make up for years of neglect, Josh throws a splashy birthday bash for Alicia, his 10-year-old granddaughter, whose mother, Daphne, is too besotted with her latest beau to care and whose father has started a new family in Florida with his new tennis-champion wife. Alicia’s school friend Bernice, similarly abandoned by her mother in favor of a new husband and baby son, is staying with the Hollands for half-term holiday, so her grandfather Leon is invited to the party as well. And Leon invites Bea Abbot, owner of the Abbot Agency, who turns out to be practically the only person who can keep her head when fire breaks out during dinner. She rushes upstairs to rescue the girls and convinces Alicia’s other grandfather, Lord William Morton, to help the housekeeper escape the blaze. She even pulls Gideon’s ditzy date, Faye Starman, to safety. For her pains, Bea ends up with two rambunctious schoolgirls in her house and a fire inspector breathing down her neck, all because Faye blames the calamity on the children. 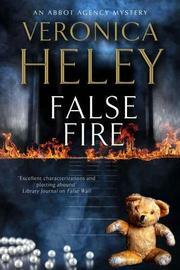 The 11th case for Heley’s smart, unflappable heroine (False Wall, 2016, etc.) proves once more that dysfunctional families can be combustible.